The ceremony will be held in the Fleming Education Auditorium. The campus is located at 730 East Beach Boulevard. Gov. Phil Bryant, who appointed Justice Ishee to the Supreme Court, will be the keynote speaker. Justice Ishee, 54, of Gulfport, took the oath of office at the Supreme Court in Jackson Sept. 18, 2017. It is traditional to hold a formal investiture ceremony later. Chief Justice Bill Waller Jr. will administer the ceremonial oath. Justice Ishee’s wife, Linda Lang Ishee, and their daughter, Lauren Ishee, will assist with the enrobing. Ishee served on the Court of Appeals for 13 years. Gov. Haley Barbour appointed him to a vacancy in September 2004. Gov. 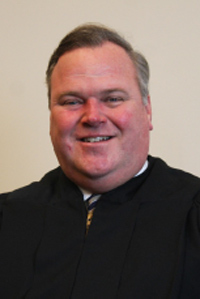 Bryant appointed Justice Ishee to the Supreme Court vacancy created by the Governor’s appointment of Presiding Justice Jess H. Dickinson as Commissioner of Child Protection Services. In his early career, Justice Ishee served for six years as a municipal judge in Pascagoula and five years as municipal judge in Gulfport. He was youth court judge pro tem for Jackson County for five years. He spent almost 14 years in private practice in Pascagoula with his father-in-law, the late Elmo Lang, and two years with the firm of Franke, Rainey & Salloum, PLLC in Gulfport. He served as president of the Jackson County Young Lawyers Division, and president of the Jackson County Bar Association. He was appointed as president of the Mississippi Bar’s Historical Preservation Committee. He chaired the Criminal Section of the Model Jury Instructions Revision Committee. He served as a special Circuit Judge and Chancellor by appointment of the Supreme Court. Justice Ishee graduated from the University of Southern Mississippi with a Bachelor of Science degree in history. He attended the University of London and received his Juris Doctor from the University of Mississippi School of Law. He is a member of the Law Alumni Board of Directors for the University of Mississippi School of Law. He was inducted into the USM Alumni Hall of Fame in 2014, and as a Fellow of the Mississippi Bar in 2016. He teaches business law and ethics at the USM Gulf Coast Campus. He is an adjunct professor at the University of Mississippi School of Law and Mississippi College School of Law, where he teaches criminal litigation and trial practice. He previously served as an adjunct professor at Mississippi Gulf Coast Community College.